Dermarolling / Microneedling / Re: Doc claims homemade vit c serum won't work?! He may just be misinformed. Remember - our advice is based on rigorous examination of the relevant medical literature. (A lot of recent forum postings here are basically: "Is it really true what you say about your product <x>?" and such questions are in fact off-topic on this forum). I can't spend too much time debunking whatever people claim, but of course I make mistakes too. ..shows the tissue levels of ascorbic acid in the skin after the topical application of ascorbic acid. The tissue levels greatly increased so it did penetrate. They mentioned that "ascorbic acid must be formulated at pH levels less than 3.5 to enter the skin". - A 5% solution in water has a pH of 2.2- 2.5. - A solution of ascorbic acid in sodium hydroxide, sodium carbonate, or sodium bicarbonate has a pH of 5.5-7.0. That is why we say in our instructions that for topical application, use pure vit. C crystals and not to use vit. C in tablets or the effervescent forms because they are usually mixed with sodium bicarbonate to enhance oral absorption and to make it less acidic. For topical application, use pure crystals of ascorbic acid and it will definitely penetrate. Pinnell SR, Yang H, Omar M, Monteiro-Riviere N, DeBuys HV, Walker LC, Wang Y, Levine M.
Duke University Medical Center, Department of Medicine, Durham, North Carolina 27707, USA. RESULTS: L-ascorbic acid must be formulated at pH levels less than 3.5 to enter the skin. Maximal concentration for optimal percutaneous absorption was 20%. Tissue levels were saturated after three daily applications; the half-life of tissue disappearance was about 4 days. Derivatives of ascorbic acid including magnesium ascorbyl phosphate, ascorbyl-6-palmitate, and dehydroascorbic acid did not increase skin levels of L-ascorbic acid. BTW, a half-life of four days means that the amount of vit. C present in the skin will halve every 4 days. A lot of disinformation is spread about ascorbic acid because as I explained in the link below, you absolutely must make the solution (diluting the crystals in water) yourself at home and not buy a prepared product. Selling plain vit. C powder or crystals is not very profitable, so the myriads of expensive vit. C products out there would have little future when the truth would be known. Last but not least, there are many medical studies where specific skin conditions improved after the topical application of ascorbic acid, thus it must have penetrated the skin. A dermastamp comes in more needle lengths and the single needle is more time consuming but more precise, and you can precicely decide exactly where to use how many pricks.. For stubborn scars and stretch marks, using both in one session is worth trying. Larger areas are very time consuming to treat with a signel needle. Thank you for mentioning your improvements. Stretch marks are in fact very deep scars, they are basically stretched cracks in the skin and the cracks are filled with scar tissue. Any improvement, even a small one is a big victory. Dermarolling / Microneedling / Re: What would be a maintenance regime after the first 18 months? Reducing the frequency of your current regime. Switching to any other maintenance routine that you have time and energy for. Medium pressure is what you should apply. Do not do more than that. The peeling is not always clearly visible on the skin and not everybody reacts the same to tretinoin. Retin A contains retinoic acid (it is also called tretinoin), which is acidic and if you apply it right after dermarolling, it will sting and the skin will likely get very irritated. Retinoic acid is basically a mild acid peel and dermarolling greatly enhances the penetration of any products applied after microneedling. In case of stretch marks, surgical- and other scars with hardened collagen bundles and in case of stubborn acne scars, I do recommend applying it straight away. No, you do not have to keep the schedule indefinitely, neither is the skin going to improve indefinitely. The point where the skin stops improving is individual. Some get almost miraculous improvements after microneedling and some get no improvements at all. Also, microneedling does not improve 100% of skin conditions in 100% of cases. The wrinkles above my upper lip and the wrinkles in between my eyebrows improved tremendously after microneedling, whereas my crow's feet have not responded at all. When you achieve satisfactory improvement, move to a maintenance schedule. From my experience, wrinkles never completely disappear after microneedling; they just significantly filled in and got less visible. Concerning hyperpigmentation, the main thing is to avoid sun exposure and protect the skin with a sunscreen as much as you can, otherwise it will surely come back. Microneedling cannot stop aging and the skin will continue to age, including wrinkle formation but microneedling results are usually long lasting. to help prevent sun damage, it is more important to apply a lower concentration it regularly instead of a high concentration occasionally. (vit. C helps prevent sun damage.) Use any concentration up to 20% if your skin can handle it. The higher the concentration, the more benefits, with the optimal skin concentration reached at 20%. 84.2% of patients subjectively evaluated their results as improvement (of various levels) in a questionnaire. "Patient self-appraisal questionnaires rated the degree of improvement (much improved, improved, slightly improved, no change, or worse"
"Standard photographs were taken at baseline, including anteroposterior and left and right oblique views to facilitate subsequent clinical evaluations, and at the end of therapy for comparison. Optical profilometry analysis was performed on the skin surface replicas of the lateral canthal (crow's feet) region, comparing baseline to end-of-study specimens. Using this computer-based system, the resulting image was digitally analyzed, and numeric values were assigned to reflect surface features. The parameters obtained included Rz, Ra, and shadows. These values provided objective data that document pretreatment and posttreatment texture changes proportional to the degree of wrinkling, roughness, and other surface irregularities." Excessive sun exposure is the main reason of skin aging and you should protect your face with or without dermarolling. If you are not prone to acne, have no hyperpigmentation or stretch marks or stubborn acne scars, there is no reason for using the A-Ret cream. Vit. C application doesn’t make the skin more prone to sunburn so you do not have to use a sunscreen. If you apply vit. C in the evening, wash it off in the morning. Do not completely shelter yourself from the sun. Sunshine is our most efficient source of vit. D, which forms in the skin upon sun exposure. Vit. D is very important for many reasons, including the proper functioning of our immune system - crucial to remain healthy. Do not excessively sunbathe but every now and then, expose yourself for about 15 minutes to the sun with lots of exposed skin to get enough vit. D.
If you have dark skin, you need to stay about three times longer in the sun as dark skin functions as a natural sun protection. Consider vit. D supplementation during the winter months. Dermarolling / Microneedling / Re: Betadine then numbing cream? Yes, first Betadine and then a numbing cream. You can also wash off the numbing cream with tap water (and a cotton pad). I will change it in our instructions. bacteria and harmful fungi from getting a foothold. packaging in a hospital, then instead of Ethanol, use our Chloramine-T.
well - from us at least. past years and that we never heard of anyone getting an infection - ever. overnight in a Chloramine-T solution and the result is total sterilization. If your stretch marks are really deep, use 2 mm needles instead of 1.5 mm. The tissue levels were maximal at 20% concentration but the tissue levels are significant at 5% as well and this concentration is less irritating and less sticky. Also, to help prevent sun damage, it is more important to apply a lower concentration regularly instead of a high concentration occasionally. (vit. C helps prevent sun damage.) Use any concentration up to 20% if your skin can handle it. The higher the concentration, the more benefits, with the optimal skin concentration reached at 20%. But 5% still is very good. "If the vit. C serum is too irritating to your skin, add more water. If your skin shows no irritation you can add more vit. C powder to your container." It is not required to use the single needles. Keep going with your dermastamp. A dermastamp is very effective. You do not have to stamp your entire face in one session. Stamp one cheek, when it heals, stamp the other etc. Yes, you can use emu oil. (BTW there is no need applying thick layers of Infadolan, apply just a little to protect the skin). The one-liner roller is not suitable for acne scars or chicken pox scars or any small scars. It is suitable for long stretch marks but it would be even better to use a 1.5 mm regular roller on the entire area and then a 1.5 mm dermastamp to stamp individual stretch marks. Again, you do not have to use the single needles - use a dermastamp. No, it does not open the skin. It is done to create ideal conditions in the skin for collagen production. 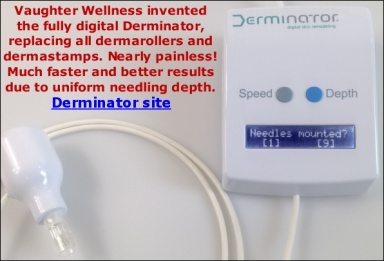 Dermarolling works even if you do not pretreat the skin but it is an additional help to have ideal conditions for dermarolling.